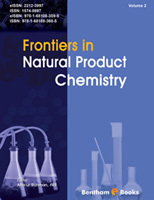 Frontiers in Natural Product Chemistry presents recent advances in the chemistry and biochemistry of naturally occurring compounds. It covers a range of topics including important researches on natural substances of plants, microbes and animals. The book is a valuable resource for pharmaceutical scientists and postgraduate students seeking updated and critically important information in natural product chemistry. The chapters are written by authorities in the field and are mainly focused on isolation, structure, biosynthesis, biological activity, and chemistry of the major groups of natural products. The contents of the present volume represent exciting recent researches ranging from horizontal gene transfer (HGT) for the production of secondary metabolites to natural products used against neglected tropical diseases. I hope that the readers will find these reviews valuable and thought provoking so that they may trigger further research in the quest for the new and novel therapies against various diseases. I am grateful for the timely efforts made by the editorial personnel, especially Mr. Mahmood Alam (Director Publications), and Mr. Shehzad Naqvi (Senior Manager Publications) at Bentham Science Publishers.